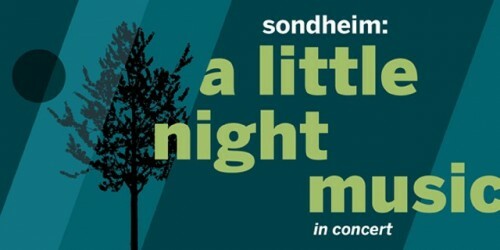 A concert version of the Sondheim classic. The staging of A Little Night Music. Let me admit right off that I have always been prejudiced against Stephen Sondheim. Here is a man who writes for the benighted Broadway stage who has so little skill at composition – or so little interest in how his work ends up – that he sends his skeletal scores out to an arranger to flesh out into their final form. The practice is common on Broadway – even Leonard Bernstein couldn’t be bothered to write his own orchestrations. As an opera snob, I sniffed that Giacomo Puccini and Richard Strauss didn’t farm out their orchestrations: their orchestrations were their compositions. They were composers; Broadway hacks like Bernstein and Sondheim were merely tunesmiths (and in Sondheim’s case, wordsmiths). So I was shocked to see that the estimable Emmanuel Music, built on the solid foundations of Bach cantatas and Handel and Mozart operas, was performing “A Little Night Music.” What would Craig Smith (1947-2007), who founded Emmanuel Music in 1970, think? Who knows, maybe in his down time, Smith gathered around a piano in some louche bar singing show tunes, but I doubted it. But it turns out that Smith’s taste was broader than I had suspected. In a program note that aims to answer questions about the appropriateness of an organization best known for performing a Bach cantata every Sunday morning presenting a frivolous musical comedy, music director Ryan Turner reminds readers and listeners that Smith liked waltz-filled Viennese operettas and that he had even conducted a performance of Johann Strauss’s “Die Fledermaus” with the group he founded. OK, time to get off my high horse. I had expected that whatever the quality of the performance I would be writing a review mourning Emmanuel Music’s decline from pursuing high seriousness in music to reveling in kitsch. How could I have been so wrong for so long? All I can say is that I can spend the rest of my twilight years catching up with what I had willfully - and stupidly – rejected: Stephen Sondheim’s musicals. I doubt that all of them will be as satisfying as “A Little Night Music” is, but I suspect I will have a good time finding out. So, thank you, Emmanuel Music, and thank you, Ryan Turner, for forcing my eyes – and my ears - open. “A Little Night Music,” based on “Smiles of a Summer Night,” a film comedy by Ingmar Bergman, is set during the late 19th century over a few days of one of Sweden’s summers of endless sunshine, during which emotional honesty breaks through traditional Nordic reserve and even the most chaste are said to give way to licentiousness. (“Summer Night’s Dream (The Voice),” the Museum of Fine Art’s great but seldom exhibited painting by the Norwegian Edvard Munch, which depicts a desperately longing woman alone in a forest on the edge of a lake, is the perfect image of the condition.) As the wise and world-weary Madame Armfeldt says, advising her young granddaughter to never marry a Scandinavian, in a land where in the winter the sun never rises and in the summer the sun never sets, no one can escape being addled. “Night Music” ’s plot is quite convoluted, but let’s just say that three pairs of lovers – one young, two middle-aged – along with the musical’s other characters demonstrate addled behavior over the course of a couple of days and very long nights. Because “Night Music” is a comedy, it all ends well, in marriages or recommitments, although there is one death, which is an acknowledgment that in the end we all must die, the most we can hope for to live a rich life. “A Little Night Music” is a profoundly humane work, dealing forthrightly with issues of life and death with a lightness of hand that belies its seriousness. The work is composed primarily of waltzes, endlessly varied in form - in his note, Turner cites the presence of gigues, mazurkas, polonaises and sarabandes, all dance rhythms, in addition to classic waltzes. Steeped in bittersweet fin-de-siècle sentiment, the work sweeps you up and along with the cast of characters, aristocratic, bourgeois and working class, who have in common the fact that they are only half in touch with their feelings and desires. We watch as they discover who they are and what they want. Just as good a number is “Liaisons,” Madame Armfeldt’s nostalgic monologue recalling her amatory life in which she remembers her affairs with a baron, a duke and a king, from each of which she received something, most importantly experience and memories - although she did, she recalls, pick up a small Titian from the Duke of Ferrara. The Emmanuel production was of mixed quality. A concert performance, it placed the orchestra on the stage instead of the pit. Large by the standard of Broadway – Turner writes that “Night Music” ’s most recent Broadway revival had only seven musicians - the 27-player band provided the greatest musical pleasures of the afternoon. Turner conducted with lightness and grace, bringing out the incessant waltz melodies so compellingly that I’m sure half the audience was tempted to get up and dance – I was. And by placing the orchestra front and center, Tunick’s orchestration was revealed to be a complex realization of the basic score, rich in color and varied in textures. The problem with semi-staged concert performances of opera is where do you put the singers, how do you dress them and what do you have them do. Veteran Boston singer and long-time member of Emmanuel Music, Lynn Torgove solved most of the problem with ingenuity and wit. Distributing platforms throughout the orchestra, she provided spaces for the singers to do their thing at a raised elevation so that they were clearly visible to the audience. Props were carried on and off as needed, and Torgove directed the singers to do whatever they would otherwise do in a fully staged production. She was lucky that the musical has little “action” – even the duel takes place off-stage in the original. The only thing I missed was seeing actual waltzes – for that there was simply no room. And I wish more care had been taken to find appropriate costumes for the female characters. The cast was not, unfortunately, all of the same quality. Even in a 350-seat theater many of the singers, primarily the women, were inaudible. Kellie McKay, who sang the sassy maid Petra, and Fredrika Armfeldt, who had the non-singing role of Anne, Désirée’s daughter, are Boston Conservatory students, and one hopes that their instructors will use the occasion to teach them how to project better in the future. Still, Emmanuel Music should have thought twice about casting McKay. She has a big song, “The Miller’s Son,” in which she expresses her modest desire for a working class husband, a welcome relief from the bourgeois aspirations of the rest of the cast. Here, however, it was lost. You couldn’t hear what she was singing about. The vocal weakness of the professional singers in the cast was more troubling. Kristen Watson, as Anne, Fredrik Egerman’s trophy wife, was utterly unconvincing dramatically as an 18 year-old virgin, and her singing was more often inaudible than not. In “Soon,” her duet with Fredrik, in which he expresses his frustration at her refusal to fulfill her marriage vows and she promises to herself to give in to him “soon,” the delicious contrapuntal wordplay of the text was completely lost as David Kravitz’s powerful singing with clear enunciation of the text received no balance from her. A wonderful moment was lost. Better was Krista River as Charlotte Malcolm, the wife of Désirée’s lover. Her spoken text was audible - although she would have been wise to have watched some old Katharine Hepburn movies to learn better how to deliver her withering lines - but her voice largely vanished when she sang, which is weird because she has sung major operatic roles with semi-major organizations. Better still was Bobbie Steinbach as Madame Armfeldt, but she was far from ideal. She looked more like a resident of an assisted living home in Newton than une grandhorizontale who had slept in aristocratic beds all over Europe, picking up tribute – that Titian – in return for her services. Primarily a non-singing actress, her rendition of “Liaisons” was adequate, but lacked the biting, almost Brechtian world-weariness the song requires not to mention the sense that she was singing a requiem for not only her self but for her entire generation and its way of life. Torgove was disappointing as Désirée. Although she acted vivaciously, she lacked the glamour a famous actress would put on before breakfast. (None of the cast was able to suggest glamour, which is a quality Boston singers – other than the late Lorraine Hunt Lieberson and the current early music star Amanda Forsythe - seem capable of.) And although Torgove has made her career as a singer, she seems to be at the end of the road as a vocal artist. Her reading of “Send in the Clowns” was labored, and she had to stretch to hit the high notes – and this is a song, written for Glynis Johns, a non-singing actress, that has no high notes. The men were much better. As Henrik Egerman, a frustrated divinity student in love with his father’s young wife – and how many mortal sins is that? he rhetorically asks – Jonas Budris sang and acted well, making the pain he feels over the absurdity of his predicament more than just comic relief. As Count Carl-Magnus Malcolm, a dim-witted dragoon who is Désirée’s lover, Dana Whiteside acted stiffly – maybe that was intentional - but sang strongly and with beautiful tone. As Fredrik Egerman, the lawyer who realizes over the course of an evening what a fool he is to have married a girl younger than his son and that his true love – if such a thing exists under the midnight sun – is his old flame Désirée, David Kravitz put in a stellar performance, which should be no surprise to those who regularly hear opera inM Boston. Kravitz spoke his words with nuanced understanding of their import and sang with vocal allure, creating a total performance that could not be separated into its component vocal and textual parts. Although it might not have been Sondheim’s intention, Fredrik became the moral and musical center of the entire work. The Liebeslieder Quintet, its idea and music derived from Johannes Brahms’s Liebeslieder waltzes, were the glue that held “Night Music” together, and the five singers that comprised it – Sumner Thompson, Matthew Anderson, Sonja Tengblad, Jayne West and Majie Zeller – provided some of the strongest and most mellifluous singing of the afternoon. Opening and closing the work and appearing throughout to comment on the action like a Greek chorus, it proved essential to the work’s success, although it played no dramatic role. The quintet understood the nature of the waltz perhaps better than any of the other singing performers and along with the orchestra made dance rhythms a constant through the afternoon. In “Weekend in the Country,” an infectious song the entire company joins in singing at the finale, the quintet had its finest moment. All in all, Emmanuel Music’s first attempt to do a Broadway musical was a mixed bag, but there were plenty of pleasures, and it helped show me that there was more to Sondheim than I had imagined.